It was that time of year again – time for the NYSF 2019 Year 12 Program Launch events – and what a great time of year with many of our alumni finishing their exams, the weather finally starting to warm up and preparations in full swing getting ready to welcome another round of young scientists to the program in January. 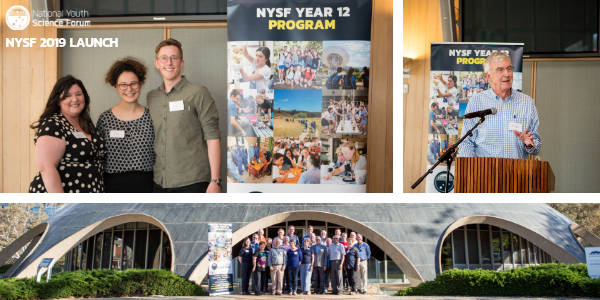 After a successful inaugural session in Brisbane in 2018, we are excited to see the NYSF Year 12 Program return to The University of Queensland in 2019. Thanks to fortunate timing, we had the opportunity to connect with our friends at Science & Technology Australia to hold the NYSF 2019 Year 12 Program Brisbane Launch as part of their Science Meets Business program, held in Brisbane from 9-10 October. Science meets Business, held annually, brings together leaders across STEM and private industryto explore how these two sectors can collaborate and how they intersect with one another. Ann Damien (NYSF 2009), speaking about her experience of NYSF and where it has taken her so far from her Bachelor of Biotechnology majoring in Molecular Sciences and Innovation Management at the University of Queensland to her current position as a New Technology Associate in the New Ventures team at Cook Medical Australia. Sessions A and C of the 2019 Year 12 Program will be held at The Australian National University in Canberra. The Canberra launch was held on 27 October in conjunction with the NYSF hosted, Rotary District Chairs Conference. This meant Rotary members from right around the country were there to enjoy the event, mingling with NYSF staff, alumni of the program from a range of years and other important friends and supporters of the organisation. Lauren Booth (NYSF 2013) a recent Honours graduate from the ANU in the area of Science, and a passionate Robogals member, who shared how venturing all the way from Brisbane to Canberra to attend NYSF, then motivated her to continue pushing her own comfort zone and boundaries to explore more study, scholarship and science-related opportunities both in Australian and internationally. To kick off the speeches, we heard from CEO Dr. Damien Pearce as well as the Deputy Chair of the NYSF Board Dr. Geoff Garrett AO, who kept us intrigued about the fascinating future of science. Both events included plenty of time to mix and network with other science folk. 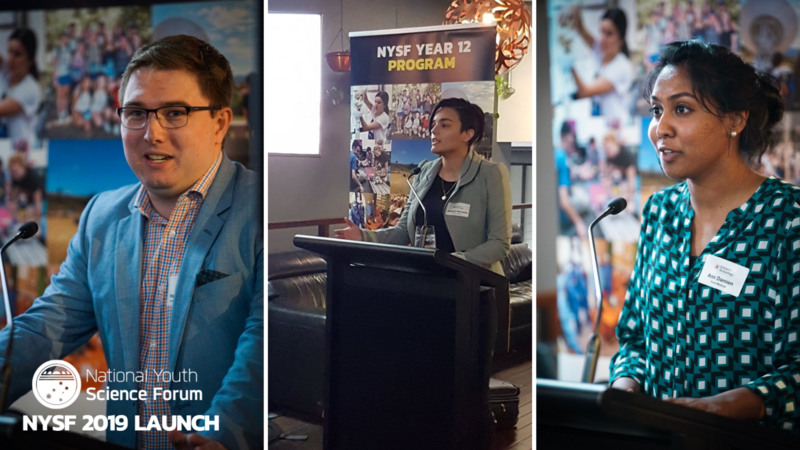 All in all, we enjoyed two highly successful and inspiring events, chiefly thanks to the insights contributed by the NYSF alumni invited to speak. It is always a pleasure to hear about the adventures of our alumni! We are now launched and ready to go. Bring on the NYSF 2019 Year 12 Program!